Bullet Hells by nature have always been a niche genre, and I wouldn’t expect that to change soon, but they have gotten a bit more attention lately by branching into other games. 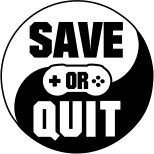 Roguelites like The Binding of Isaac and Enter the Gungeon have plenty of attacks that wouldn’t be out of place in a traditional Bullet Hell, and even some platformers like Hollow Knight or Rabi-Ribi can say the same. For games like these, you need a lot of concentration and hand to eye coordination, which can be difficult at times. But what if you wanted to make things even more complicated? 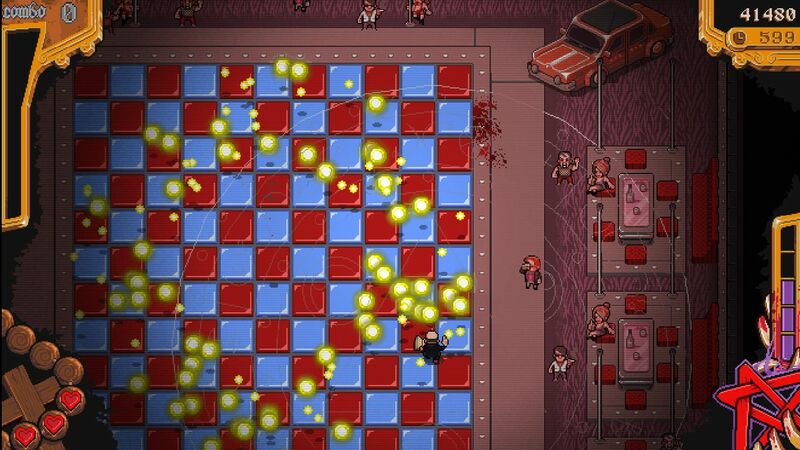 Well, The Textorcist has a good idea for how: as the title implies it’s a Bullet Hell crossed over with a typing game. 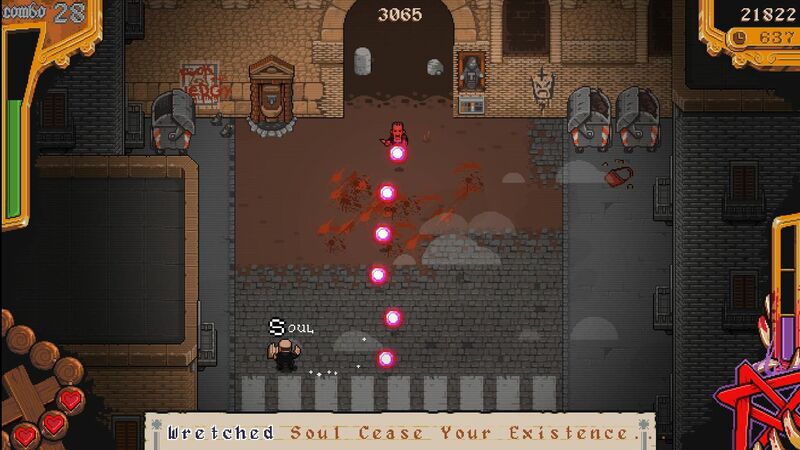 You play as a grizzled, hard-as-nails priest named Ray, who has the ability to exorcize demons (and deserving humans, as one thug finds out in the prologue) by uttering scriptures from the Bible. In gameplay terms, this amounts to you typing out holy phrases on your keyboard with one hand, while dodging a variety of unholy attacks with the other. Naturally this takes getting used to, not only because it’s a different formula for the gameplay but because by design it splits your attention between two equally important things. That sounds like it could be annoying, but it’s fairly lenient: you need to get hit twice quickly to take damage, as your health is only vulnerable once you’ve dropped the book Ray reads from. You need to pick it back up in a hurry though, as laying it on the floor for long enough resets your progress in whatever passage you’re typing. The demon only has the tutorial and two bosses, but that was enough to show me there’s a lot of potential for risk and reward: you can type more slowly with one hand while dodging attacks carefully, or take whatever moments you can to type with both. There’s a high score system, and I can imagine some kind of ranking system will be made for the game’s full release as well. The game’s presentation also deserves a nod, as you don’t just type during the boss fights, but in all aspects of it. To begin the game you type Continue, you interact with NPCs and points of interest by typing ‘Talk’ or ‘Look’, and so on. It makes it feel like they really wanted to stick to the game’s gimmick, and I have to respect that. The only problems I can mention are that the game’s humor might not grab everybody, as it’s trying so hard to be gritty it can come off as a bit much. There’s one joke about privilege-checking that had me rolling my eyes. However, there are still some good lines here and there. 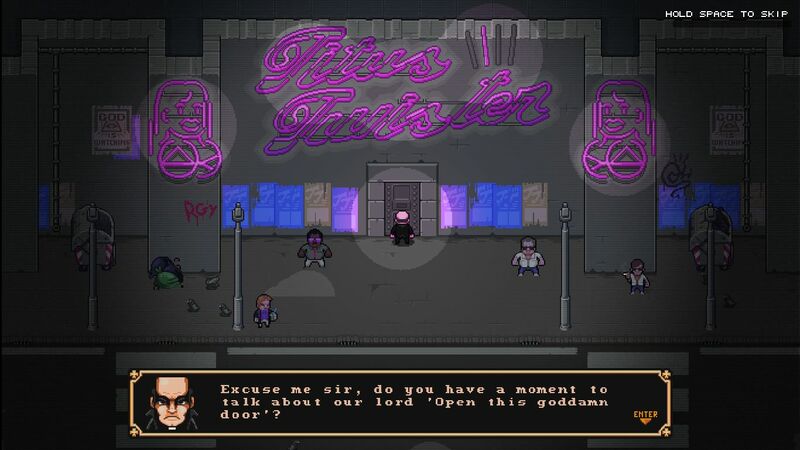 The Textorcist still seems to be in an early state as of this review, not having a definite release date other than a vague first quarter of next year. What I’ve played so far of it though, makes me think it’s definitely one to watch. I’ll be keeping my eye on it for sure.